For starters how can you not, as a film buff, film lover, movie watcher not be utterly enthralled with the cast of this film. The master Richard Harris. The master Carroll O'Connor. The master, stunning goddess Julie Andrews. Master Malcolm Atterbury. And the one of a kind master, which words can’t describe his flawless talent in cinema, Max von Sydow. The extraordinary master Gene Hackman. The amazing Michael Constantine and Lou Antonio. If that does not pull you into this film then you really shouldn’t be calling yourself a film buff. That mastery in talent of performance should showcase to you the amazing performances in this film. What a cast to behold in one feature film. This is the first time seeing this and showcasing that cast of actors, and actresses blew me away. The movie itself might not be a masterpiece but the cast in front of the camera is. This is a grand classic film of the 1960’s. The plot is you have Christian Missionaries coming to Hawaii to spread their beliefs upon what is considered to them and an island of paganism. Now I can sit here and ramble on about the right and wrong reality of this, but I am not, I am reviewing a movie, not politics and religion. Yes, some will say it’s wrong, and yes some will say it’s right, we will leave it at that. Now aside from the film, there is really a whole bunch of cool film history behind this production. For one there is an uncredited role by Bette Midler who makes a screen appearance as a passenger. The character of Malama was played by a real Tahitian, Jocelyne LaGarde. Who did not speak English. They trained her in dialogue to undergo the part. Amazingly she is the dynamic glue to this film, her part is beyond brilliant. She was nominated for an Oscar, and also won a Golden Globe Award for this part. She was breathtaking and showcased a raw talent of performance. She had never acted before so you got this natural essence of reality through her role. Directed by one of the greats in cinema George Roy Hill, who really needs no introduction to the cinema world. He has mastered such greats as 1969’s Butch Cassidy and the Sundance Kid, 1973’s The Sting. He directed one of my personal favorites Slaughterhouse-Five. He also was honored with another Twilight Time Blu-ray The World of Henry Orient which you can read my review HERE. Hill had a long career in the movie business. He created many wonderful pieces of cinema. He is probably best known for Butch Cassidy and the Sundance Kid. Many of his films were nominated for countless awards. The Sting itself racked up 10 nominations and 7 wins. His career was a defining reality of cinema history. The film itself is a wonderful mixed bag of great acting, amazing cinematography, and perfected music, direction, editing and an all-around classic in my view point. It’s a movie of the old days when humans looked at bringing religious beliefs to islanders, and saw nothing wrong with it. We today look at this reality as destroying history, changing beliefs and forcing others upon beliefs that we saw fit. As I have stated, don’t go into this in a political or religious viewpoint, go into this in experiencing a classic style film that has dynamic acting performances. Also something that needs to be mentioned is the amazing cinematography in this feature. Done by one of the greatest, Russell Harlan. He was an award worthy master. He racked up 6 nominations. He worked on such amazing films like, To Kill a Mockingbird, Run Silent Run Deep, Witness for the Prosecution, and one of my personal favorites, the flawless science fiction film, black and white classic, 1951’s The Thing. He was a master in creating memorable imagery. 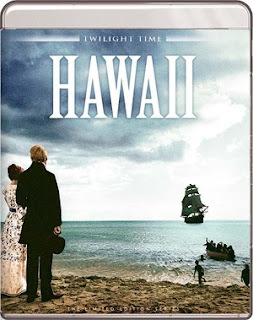 Hawaii is based off the book by the same name written by an amazing author that I highly recommend. I have read 6 of his books, he has published over 40. His talent is grand in storytelling and I highly recommend the book, Hawaii. He also won the Pulitzer Prize for Fiction in 1948 and he rightly deserved it. I recommend reading Tales of the South Pacific. Also other greats are Texas and The Fires of Spring. Hawaii is one of his greats and the movie adaption is a prime example of his beauty in the expertise of writing. Another flawless and dynamic outlet and example of how to treat a film with wonderful audio and video transfer. I have never seen this before, but what is great about this, is the two versions you get, the Original Roadside Version which is not restored and is standard, and the Blu-ray Version. So you can compare the quality of how amazing the transfer and restoration to HD was by Twilight Time. The Twilight Time Blu-ray is amazing video and audio quality. Stands out like a whole new picture. The all-important isolated music track and also something that is fantastic the 189-minute version of the film, although this is not in High Definition it still is a wonderful bonus. I have never seen either versions of the film and so being able to watch it twice in two different ways was very worthy entertainment and a wonderful trip into film history. The 189-minute version showcases the overture, intermission, entr’acte and exit music. This reality was great in being able to experience the music for the movie. Many movies of this era had these intermissions to allow for breaks, or to get ready. Something I absolutely love as a film lover, self-proclaimed film historian in training is adventuring into all versions, information or history of films. I enjoy finding alternate versions, or deleted scenes. So this special feature was a grand experience seeing both versions for the price of one. Isolated Score Track. Now this is an important extra, the Isolated Music Score. The score is by one of the greatest musicians to ever live. Elmer Bernstein. He created throughout the years many wonderful pieces of music. A composer and conductor of many memorable pieces throughout cinema. His music film scores have always stood out. It’s a true shame to even say he was just a musician. His countless years of music love throughout cinema shines. From such amazing films as, The Ten Commandments, To Kill a Mockingbird, Ghostbusters, The Magnificent Seven, and many, many others. I could write a whole book on this man. His genius, his work, his sounds, his visionary expertise in the art form of music. This is a wonderful extra on this Twilight Time Blu-ray. Original Roadshow Version (189 Minutes) in Standard Definition. This adds the music intermission and entrance and extras shots. This version as I have stated is not HD it's in the old ways. It's amazing looking back at these older versions and thinking how did we ever watch these, when comparing to the beauty of a Blu-ray or even a restored DVD. This amazing movie, amazing book and a wonderful Blu-ray to have. A few slim extras. A wonderful transfer in video and amazing audio. Twilight Time does it again in bringing a new outlet for an older film. Twilight Time always brings out wonderful products. I feel this is another prime example of how to treat a film. They don’t make films in an epic setting anymore, or at least they are few and far in number, but thankfully companies like Twilight Time, honors these often forgotten about important pieces of film history. Highly Recommended.